It seems like just about anywhere you go these days there are places that will teach some kind of grappling or submission fighting. So when I heard that the Minnesota Kali Group in Minneapolis taught Brazilian Jiu-Jitsu, I wasn't surprised. Knowing their history with such names as Dan Inosanto, Rick Faye and Erik Paulson, I was expecting to have a class that was heavy in foot and wrist locks. One of these days I'm going to get tired of being wrong. 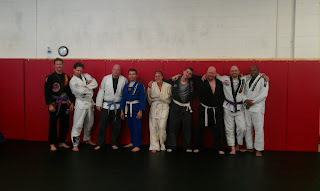 In the class lead by head BJJ instructor, purple belt Fabio Morescalchi (which I thought was a kind of cheese until he was crawling all over my back and cartwheeling past me) I was treated to a different kind of grappling than I was used to. Sure, everyone learns the inside-the-box basics and positions. However, Fabio used those more as a guide than an end-all-be-all. Fabio's movements were far more dynamic than I was used to and the flow chart that seemed to exist without limits in his head just kept pouring out. Variations on variations on variations. Now, I have had some experience with the grapplers at MKG and now I know where they get it from. No, not the computer generated movie or that weird tv version with the dinosaurs. THE CARTOON! F*** it, never mind. The atmosphere inside MKG was all it's own as well. The bass from the stereo could be heard bumping outside. Inside, there were groups doing Muay Thai, Crossfit and Kali. Several stations of weight racks and wing chun dummies opened to the grappling floor and boxing ring. I was familiar with these floor from the several MKG Grappling Tournaments that I have attended (see SHAMELESS PLUG below). However, I had never been inside the gym when things were in full swing. While we rolled, the Kali class was doing things with sticks and knives that made me feel like less of a man. Remember those kids in high school that were quiet and unassuming? They probably wore glasses and did well in math. You might have even made fun of them. Well, now they do Kali and know how to cut your head off. So, if you are smart, you will buy them a drink at your next high school reunion and bury the hatchet. So they don't. In your liver. The was a different energy to the gym. The tempo and pace of it all seemed to make everything keep moving. Not just my partners, but the walls. The place was alive. It has been a while since I had that much motivation to keep rolling. Sadly, the night ended, as it is prone to do. I took my leave with only a mild sense of regret knowing not because that the bar had been raised on my quest as far as atmosphere, but because I knew the next time I would be here, it wouldn't be to roll. SHAMELESS PLUG: On 08/13/11, MKG Minneapolis will be hosting their annual No Gi grappling tournament. This is an adults only comp that will be double elimination. Stay tuned for more details in regards to time, divisions and cost. But pay attention, you don't want to miss this one!! !